XD150 provides flexible resolution versus extension distance options, ranging from 500ft (150m) extension distance for a single 1920 x 1080 screen to 330ft (100m) extension distance for a single 1920 x 1200 screen. The transparent USB 2.0 link supports most common USB devices such as mice, keyboards, touch screens, graphic tablets, jog shuttles, joysticks and mass storage devices. Isochronous devices such as web cams and headsets can also be used. The extender has an intelligent EDID management to allow the true characteristics of the monitor to be passed back to the computer. A KVM switch mode is also provided for improved compatibility with KVM equipment. The whole system is flash upgradeable from the computer end for future compatibility. 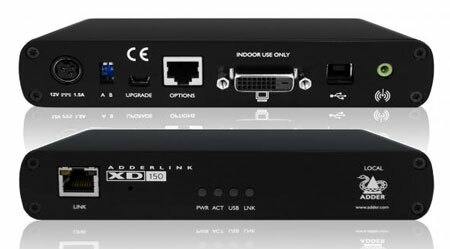 The XD150 video extension system is uncompressed, where by every pixel of every frame are sent without loss and in real-time. Installation is straightforward and there is no need for any extra drivers or software to be installed. CD audio quality (stereo channel 16 bit sampled at 44.1kHz) is available to transfer stereo audio from local to remote for Line Out. RS232 can be passed between the units to a maximum baud rate 115K2 via the options port. 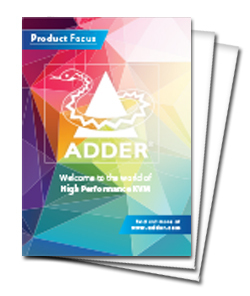 Adder's RC4 remote key switch is also supported. An easy-access rack mount kit is available (RMK8) for neat mounting of two XD150 units in 1U of rack space. Receiver (RX) DVI, audio 3.5mm out, USB type A x 4, RS232 10p10c options port. Power 3 Pin Locking DC jack (2 x power adapter included), 100-240VAC 50/60Hz, 0.7A, input to power adapter, 12VDC 18W output from power adapter. XD150 is also known as the XD150-US and XD150-USA.